The desire for convenience by consumers is reshaping the retail sector, where retailers are scrambling to offer a seamless shopping experience with latest technologies such as self-service checkout systems and contactless payment technology. In such a scenario, Asia-Pacific (APAC) is leading the race in encouraging its population to become a completely cashless society, with consumers in the Philippines and China in particular using e-payments in their everyday purchases, says leading data and analytics company GlobalData. According to the company’s 2018 Q3 global consumer survey, over a quarter (25%) of consumers in China find stores that support advanced payment methods such as Apple Pay, to be one of the most convenient when deciding where to do their grocery shopping. 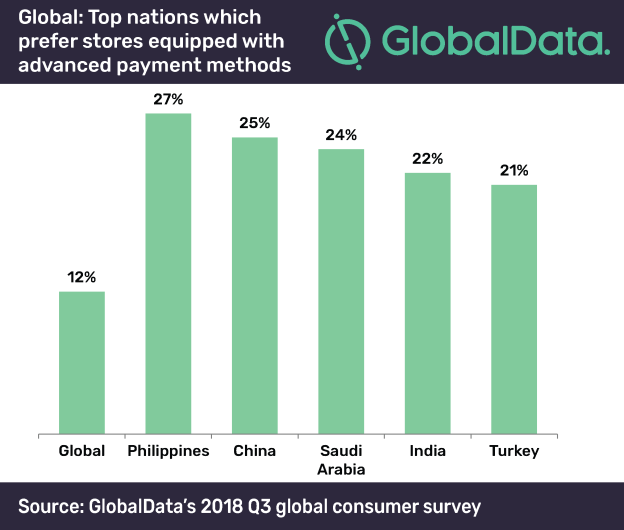 The survey further reveals that APAC countries, such as the Philippines and China account twofold greater in terms of consumers showing preference towards stores with advanced in-store payments, in comparison to the global average. With e-commerce being the key to Asia’s modern way of shopping, the giant e-commerce platform Alibaba is making the shopping experience more convenient by encouraging mobile and online payments, luring in today’s digitally savvy and time-pressed consumers.